This morning the United States Supreme Court ruled against Aereo, a startup that employed myriad, tiny antennas to bring broadcast television to consumers digitally, saying that it operates in violation of the Copyright Act. The startup, which previously stated that it had no ‘Plan B’ in the case of loss, is troubled. Broadcast stocks, however, are anything but. CBS is up more than 4 percent today, as are other parent companies of broadcast networks. Comcast, which owns NBC, is up over a percent, and Walt Disney, owner of ABC, is up around 1.5 percent. 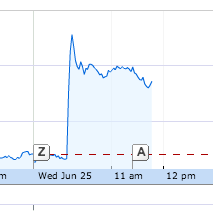 Each stock has a similar surge in its price coinciding with the ruling’s timing. That indicates that investors were skittish about Aereo presenting a threat to broadcast television’s business model. The streaming service would have furthered the ability of consumers to watch television content on their own timing terms. TechCrunch has more on Aereo’s technology, and the details of its court loss. The startup has raised $97 million to date, implying a high valuation. That figure must be greatly diminished in the wake of today’s ruling. On the other side of the coin, the bounce to CBS’s valuation today is worth more than $1 billion. The financial impact of the Supreme Court’s decision is therefore impressive. We’ll have more once Aereo responds to the ruling. It isn’t clear what is next for the streaming company, but I doubt it’s ready to give up. Sadly for the nascent enterprise, there isn’t a higher court for it to appeal to. What happens next will be interesting indeed.